Decadent thick and delicious hot fudge. Simple to make and so much better than store bought. 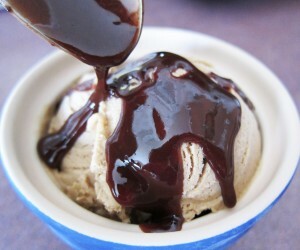 This hot fudge recipe came from a book called Red, White and Blue Ribbon 2004. It is filled with recipes from all across America. Kevin eats any leftover hot fudge with a spoon, minus the ice cream. In a saucepan, combine chocolate syrup, sweetened condensed milk, and butter. Bring to a boil, lower heat and simmer for 5 minutes. Stir in vanilla; remove from heat.